We picked up the Conestoga from See Grins just in time for a weekend trip into the Sierra Nevada Mountains. Earlier in the week, we had taken the Conestoga into See Grins to have the interior white LED lights examined as they seem to be, one by one, going out. According to posts in various RV BBs, this appears to be another example of Winnebago sourcing cheap overseas components and questionable QC. In any event, 3 of them were replaced. We also could not get the King OTA Digital antenna to turn on. It turns out that Winnebago wired in a bypass switch in series with it (it is a small post type switch on a wall plate next to an RF input underneath the cabinet), which separately powers the OTA antenna. I’m not sure why that bypass switch was put there but when time allows, I’ll use a multi-tester to trace it. 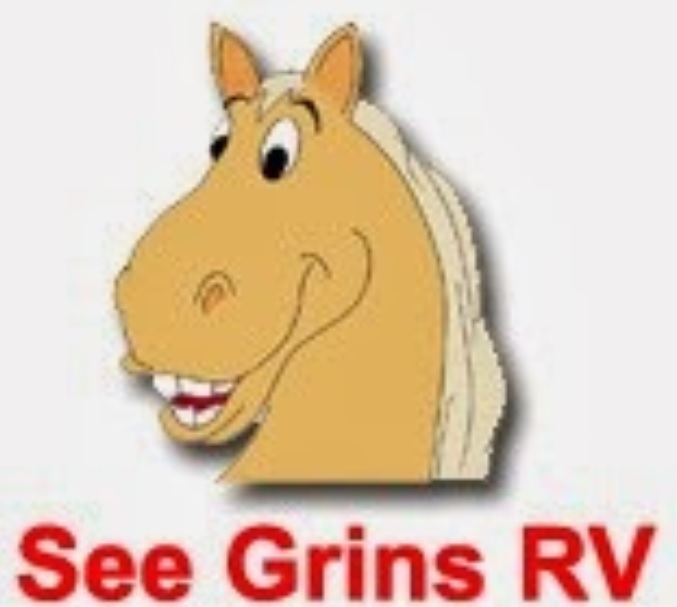 Daniel V., the See Grins service writer, provided good service, so although the Talking Horse has some bad Yelp reviews, we received good, prompt and professional service. We headed out of San Jose Saturday morning and made it to the foothills north of Sacramento by noon. 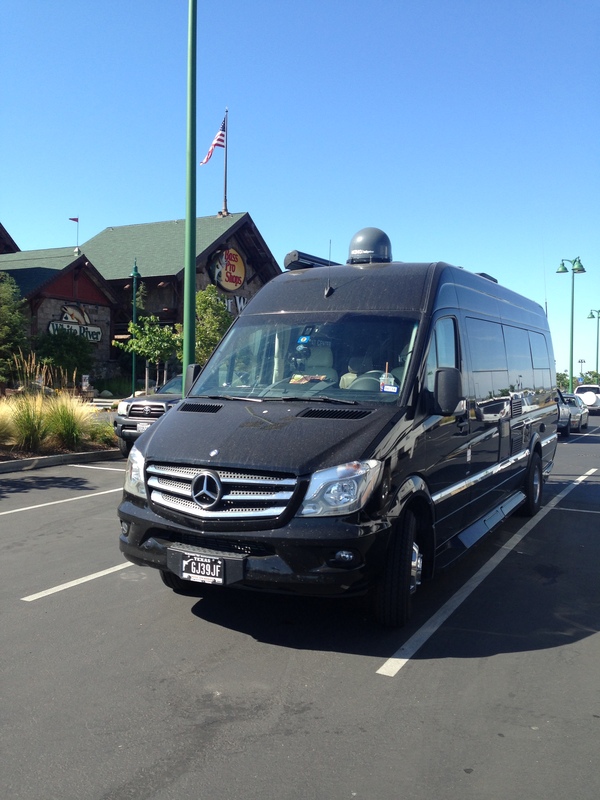 We had a quick stop at Bass Pro to get some camping supplies then commenced the altitude climb from 300 feet. 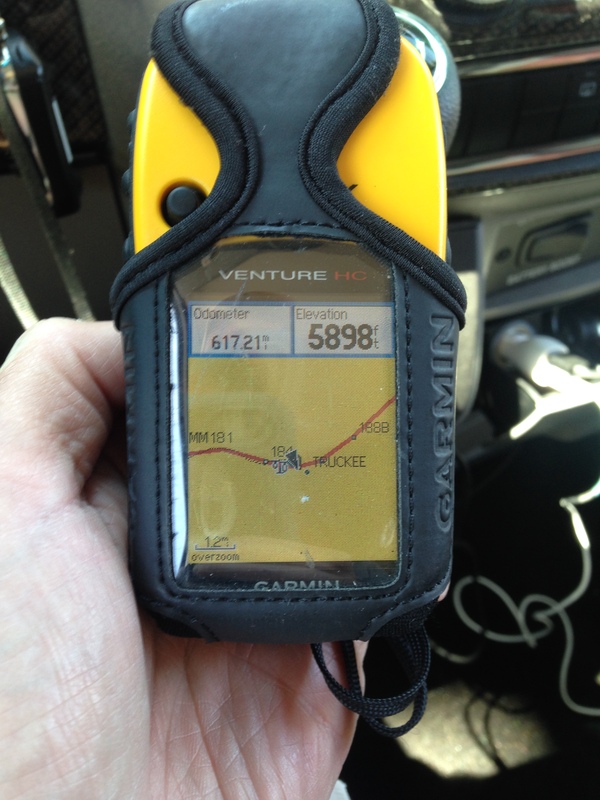 As you may know, we use a Garmin GPS, charts and a sextant as our means of navigation as the Xite unit with the AM, FM, CD, DVD, GPS, XM and knife sharpener continues to under-impress. 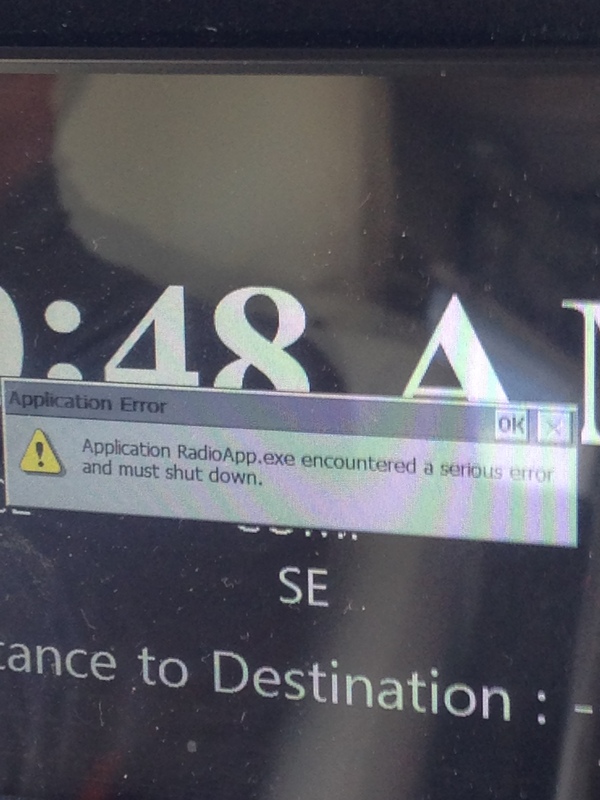 It threw us a new error message on the way out of town. Meh. While S looked for the CTRL-ALT-DLT on the in-dash unit, the flawless Garmin GPS had us crossing the 7,000+ foot Donner Pass by 1:30 p.m.
Our plan was to make camp (which means plugging in the 30 Amp service and extending the awning) at the Little Truckee River RV Park just east of Truckee CA, but all their regular sites were taken. So we paid $22 for overflow parking so as to least have a place to dry camp. 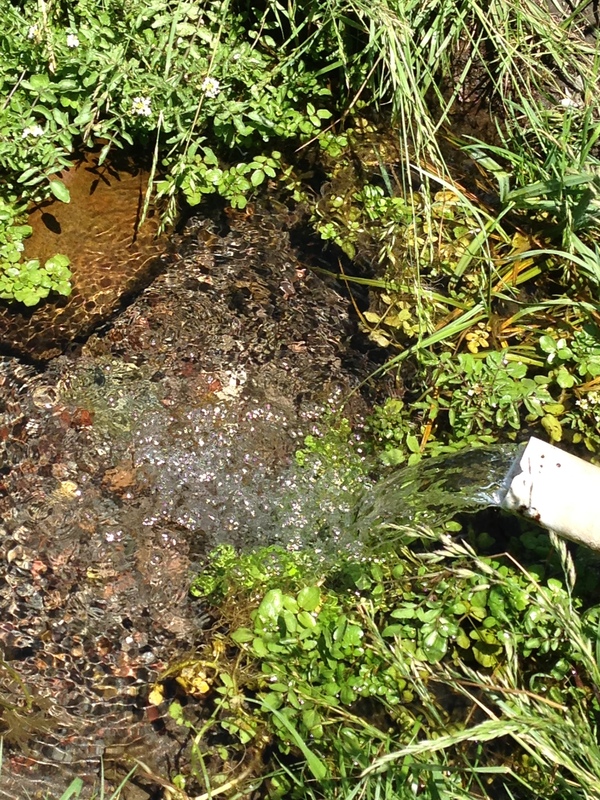 To our disappointment, overflow turned out to be the side of a gravel road in the RV Park. The Little Truckee River RV Park looked nice, with a well stocked store and propane service. Just be sure to get a reservation before you show up. We took advantage of the propane service and added several pounds of, as Hank Hill would say, God’s gas. We parked on the gravel road and had the steads saddled up by 3 p.m. 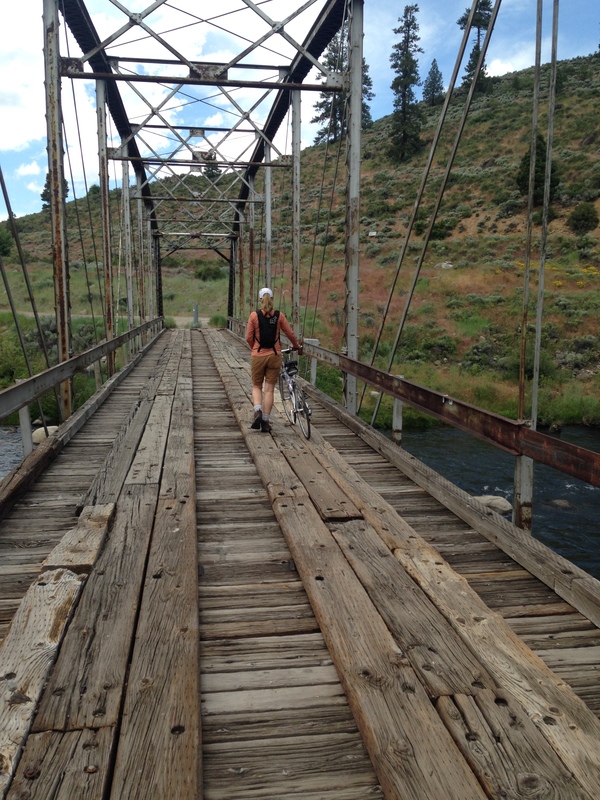 The plan was to scout the surrounding area along the Little Truckee River for a few hours. The RV Park is just south of Interstate 80. 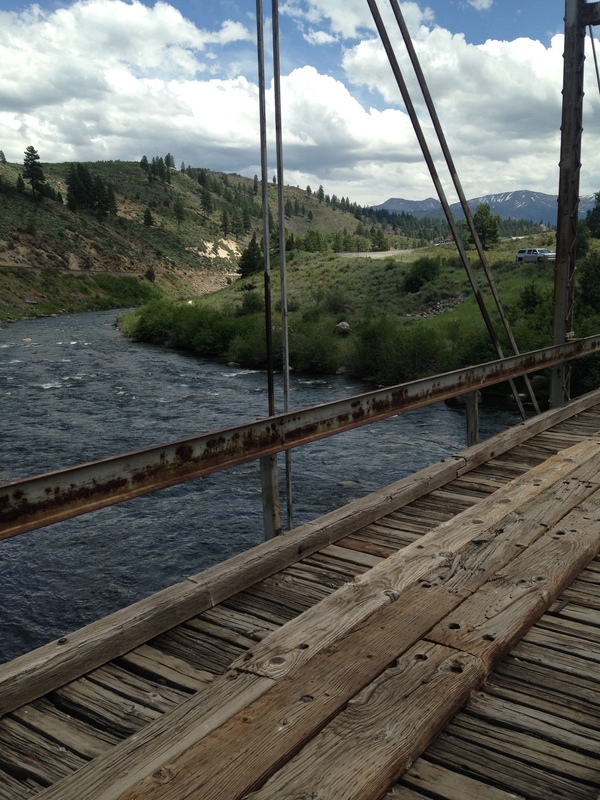 We headed north under the overpass and across the Little Truckee whereupon we stumbled upon the abandoned town-site of Boca and the Boca Reservoir. Much has been written about the California drought, but the melting snowpack from the heavy snow over the winter is quickly refilling the rivers and lakes. 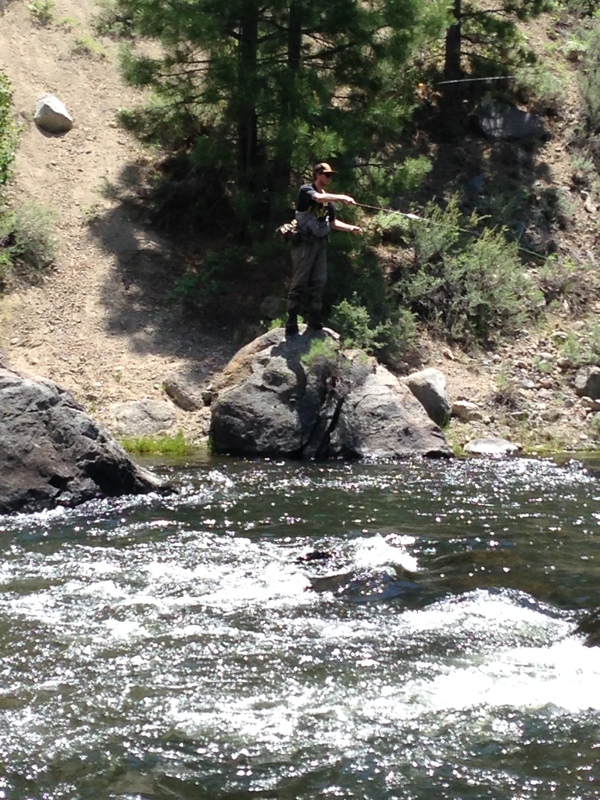 The Little Truckee River is flowing at its highest rate in several years. 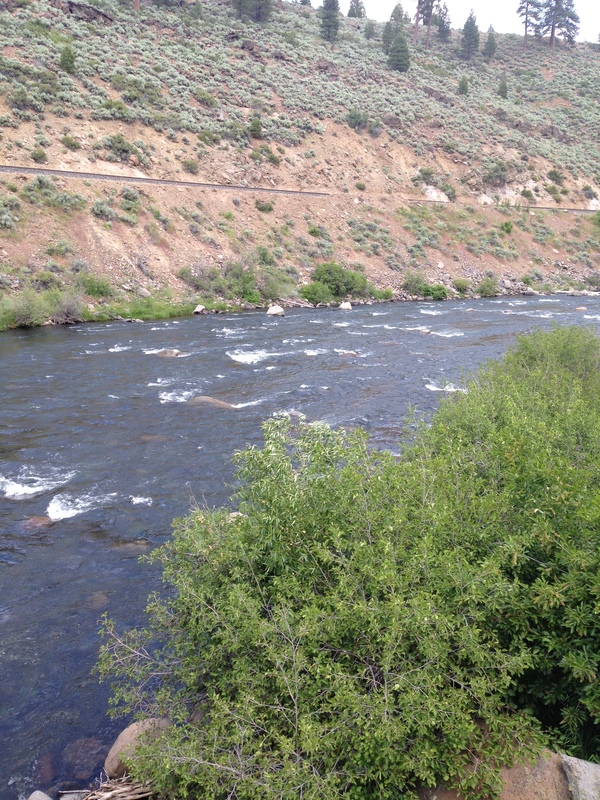 We watched a number of fly fisherman slapping the water and calling trout with their trout whistles. 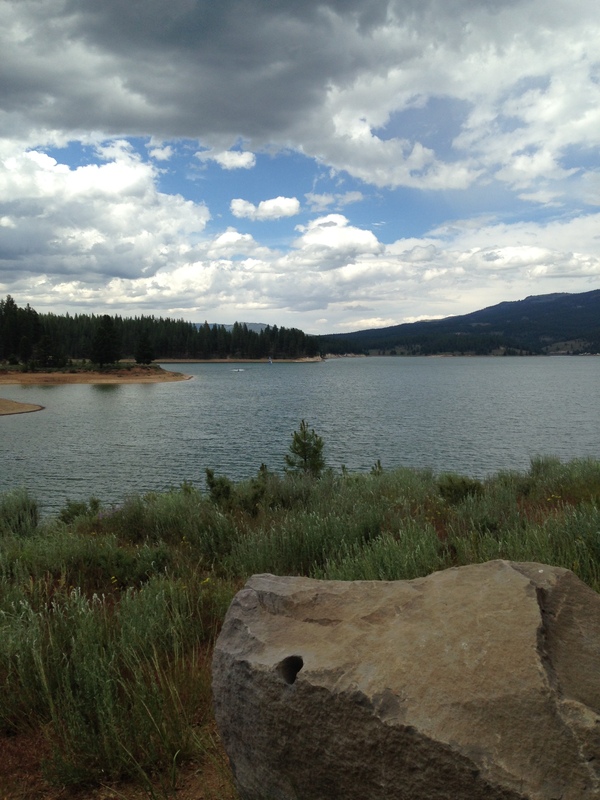 Surrounding the reservoir is the Tahoe National Forest which is federal land. The TNF has dry camping sites. 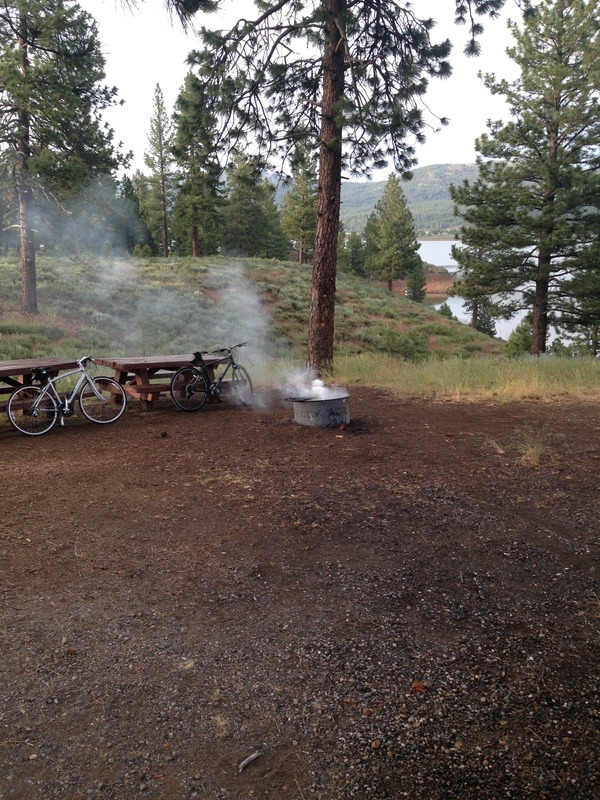 We rode our bikes around the TNF and came across one of the better sites with nice Jeffrey pines overlooking the water. 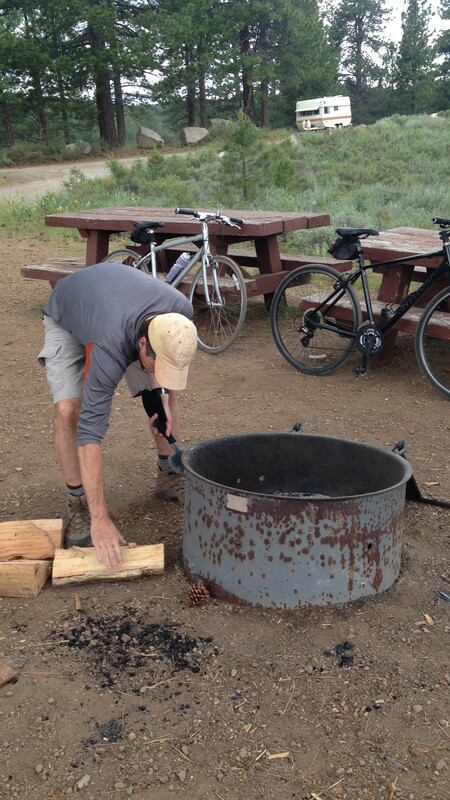 There was a placard on the picnic table that indicated it was not reserved, so S stayed at the site (as advance party claiming squatter rights) while I hightailed it back on my bike to the RV Park to get the Conestoga. The cost for the site was $20. 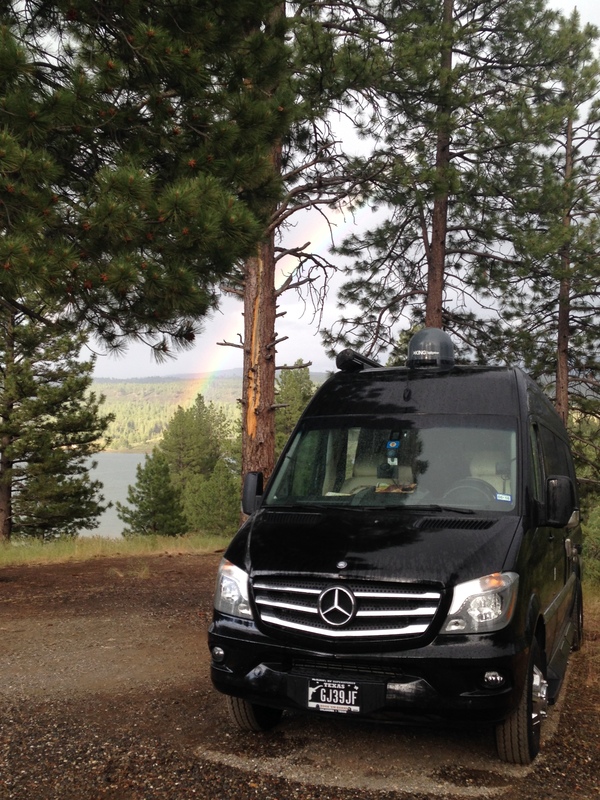 We consider the other payment to the Little Truckee River RV Park to be a loss and will deduct if from our 2016 taxes. 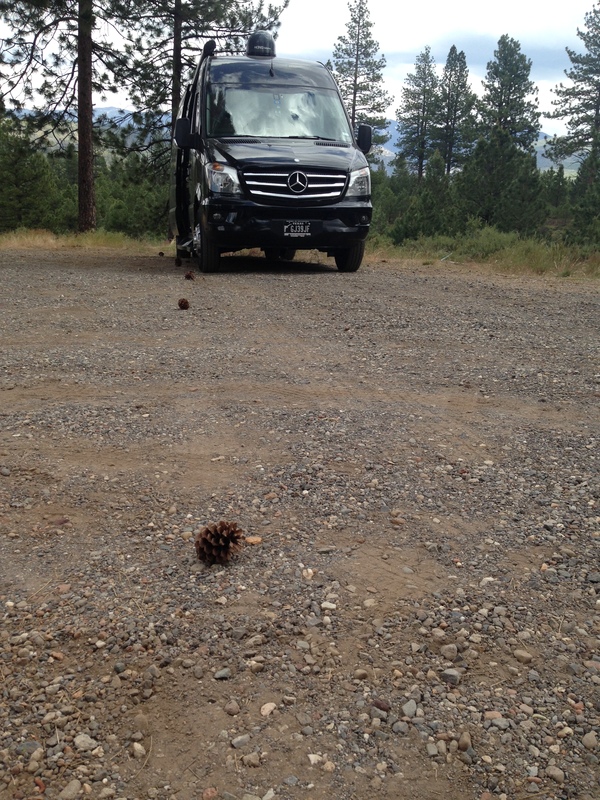 Unable to gauge the exact location of the drop off into the lake while parking the Conestoga at the new site, we used the primitive method of pine cone alignment to guide the RV into position. I understand that the Google self-driving cars use similar technology. 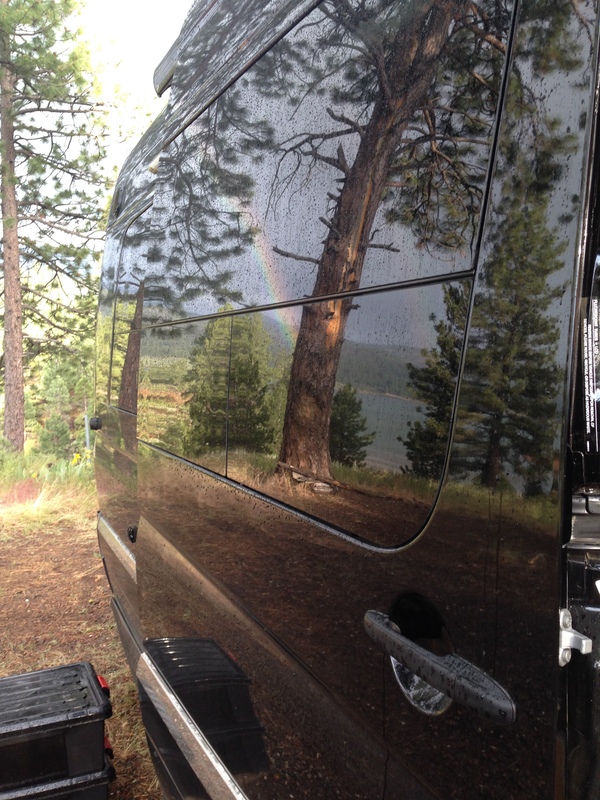 We established base camp at 5,800 feet just before an afternoon thunderstorm rolled through camp. A major catastrophe unfolded as we had the awning extended as the gust front arrived. As every 3rd grader knows, a typical RV awning cannot withstand more than a 5 mph wind without twisting up and over itself. The prospect loomed of having to use my small axe to cut off the awning from the housing to get the RV back to the Bay area. We saw first hand the destruction a 55 mph wind can inflict on an RV awning on our trip across the wind blasted Mojave Desert earlier this year. Unlike the guy in the Mojave, we were able to get our awning back into the housing just in time. When we later tried to extend the awning, it would not. I was concerned that the awning had been retracted askew. We climbed up and pulled slightly on the edge of the awning and were able to get it to extend. Looking back, it was not really that big of a deal. 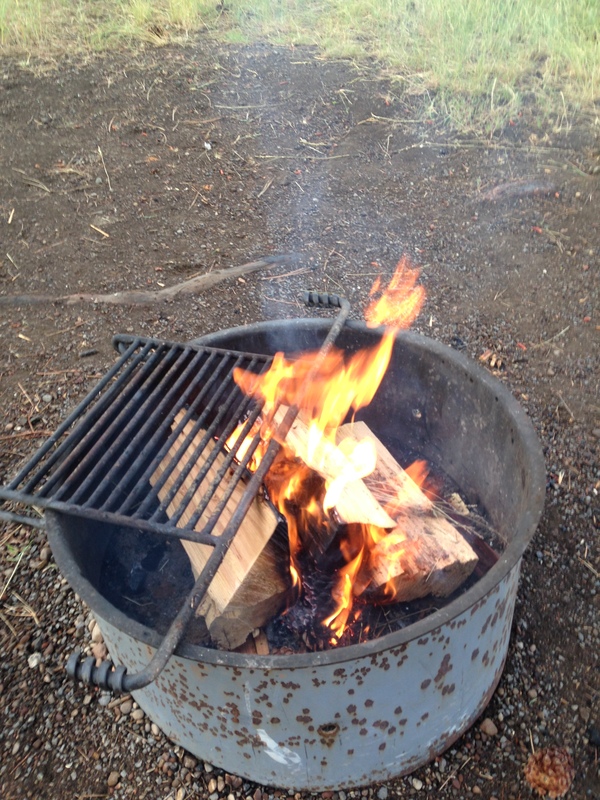 Like early pioneers, we purchased pre-chopped wood for $8 from the camp host. That did not stop me from taking a small axe to the bundle for no apparent reason. Our goal was to create fire to put our species on the path of civilization and to toast marshmallows. With light rain still about, and no fuel in the large novelty cigarette lighter, all seemed lost. [Insert Donner family reference here]. Fortunately, water proof matches, tinder and prepper skills combined to create smoke. And then, FIRE. The sweet sound of gunfire off in the distance confirmed that the guns law applicable in the People’s Republic of California do not apply to federal forest land. Although we hiked with bear spray (this is black bear country), having a .45 was considered a value add. Yet the experts agree. If you are going to use a handgun against a bear, save the last bullet for yourself as all you will do is make the bear angry. After the rain passed, a brilliant rainbow formed across the reservoir. All we were missing were unicorns. Our camp host suggested we take a hike to the Boca Springs. The quarter mile trek was rewarded with a view of one Mother Nature’s greatest creations: PVC pipe. For sustenance, we relied on the old cowboy standby, soft tacos and potato chips. Around dusk, our campsite was visited, not by unicorns, but by 2 good sized deer, which, if you squint your eyes just right, look like horses. We took pictures of them, but they refused to sign the copyright release so we are unable to post those pictures. 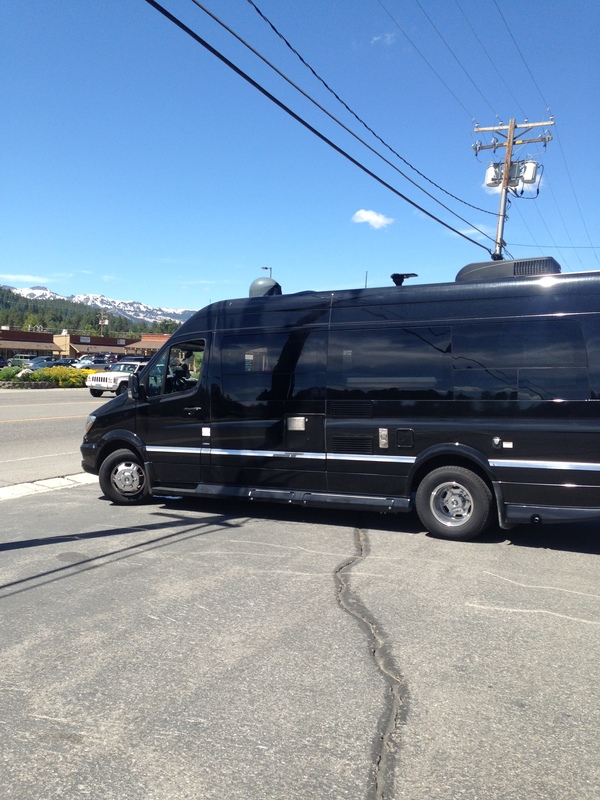 We broke camp Sunday around noon and headed into Truckee for poorly prepared fajitas and some mountain town shopping. Unable to find a musket loader and snow shoes for the trip down to Sutter’s farmstead, we filled up with Diesel #2 and merged onto Interstate 80 headed west. 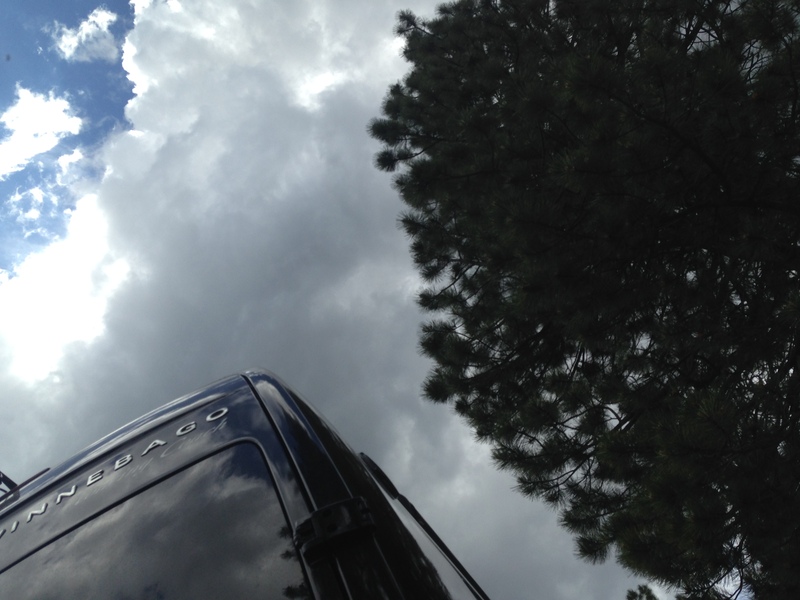 On the trip down the mountain, we passed 15,000 miles on the odometer (Winnebago Warranty Department cheers). The next weekend, we were back in Texas for the Must Dash 5K. A flat, fast course in hot and humid conditions– 80 Degrees at the start. We were joined on the run by R&S Jr. M time: 28:10. S time: no comment as she paced a walking S Jr. who sandbagged her at mile 3 with a sprint to the finish. 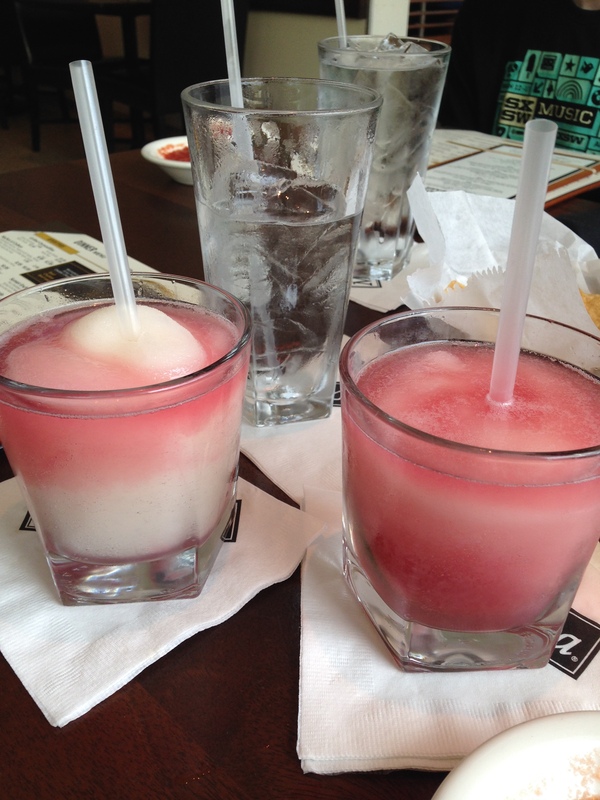 Traditional Margaritas with untraditional Mambo Taxis at MiCo highly recommended for re-hydration. 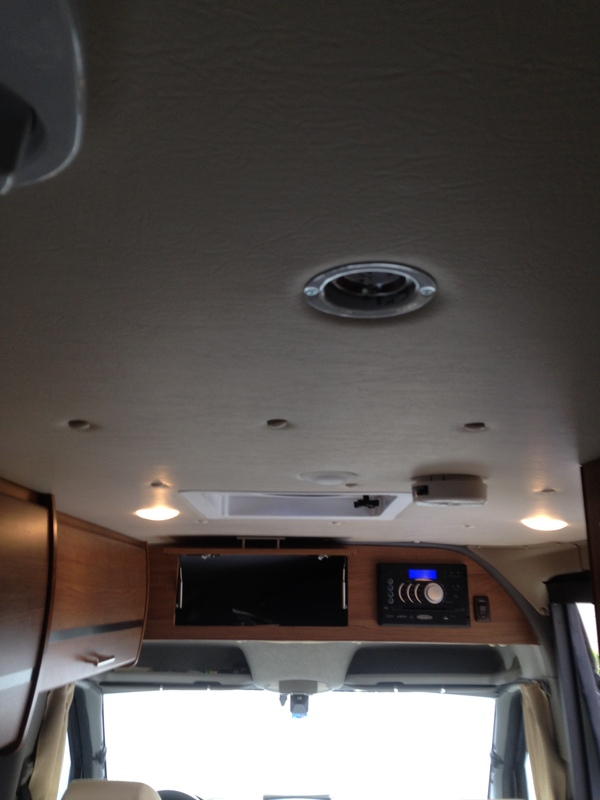 This entry was posted in California, Class B, Mountains, Weather, Winnebago, Xite and tagged California, ERA, Warranty, Winnebago. Bookmark the permalink. I have an ultimate set of camping gear that hasn’t been used in years. Coulda saved some bitcoins. Also, I highly recommend .458 SOCOM for bears.